Michael Crawford returns to the London stage to play Leo Colston in David Wood’s adaptation of L P Hartley’s novel about the tragic shattering of innocence, The Go Between. 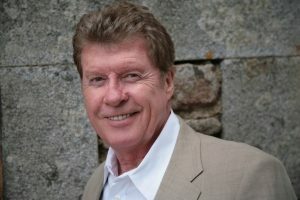 Michael Crawford stars in The Go-Between – image: Gabrielle Crawford. In this new musical, a man who can no longer hide from the memories of his past returns to where his childhood ended – the Norfolk country estate of a school friend. Reliving the gloriously hot summer of 1900 and memories of his days spent with the Maudsley family come flooding back. We then travel back in time to find young Leo, a fish out of water in the upper-classes of British society, acting as the go-between for his friend’s beautiful older sister, Marian, and tenant-farmer, Ted, who are embroiled in a forbidden secret love affair. The innocent Leo gets caught up in the adult atmosphere of deceit and manipulation as he risks everything in this deeply moving coming of age story. The events of that summer and the devastating effects of love denied will shape his life forever. This musical is sure to have a lasting effect on The Go Between Theatre Breaks guests. Theatre-goers of a certain age will remember Michael Crawford as the hapless and accident-prone Frank Spencer in the 1970’s comedy series Some Mother’s Do Have ‘Em. He then went on to star the musicals Barnum and, what he is probably best known for, The Phantom of the Opera, surprising an unsuspecting British public with his singing voice. More recently he has appeared as the Wizard in Andrew Lloyd Webber’s 2011 revival of The Wizard of Oz at the London Palladium. Closest hotels : You have the recently re-vamped 4 star deluxe Radisson Blu Mercer Street within a 10 minute walk as well as the 5 star Radisson Blu Hampshire in Leicester Square opposite the contemporary 4 star Radisson Blu Leicester Square hotel. A further walk away on the other side of Covent Garden, there is the 3 star Covent Garden Travelodge which is ideal if you are looking for a basic hotel room in a fantastic central location. With the Apollo theatre’s closest station being Piccadilly Circus on the Piccadilly and Bakerloo lines, this gives you easy access to hotels in Kensington, Earls Court, Paddington and Regent’s Park areas too. I absolutely loved The Go Beteen starring Michael Crawford. It was lovely to see him on stage but more importantly in such a good show! I love the smaller musicals and, done in a Chmber style, with just one piano on stage to provide accompaniment, the paired down production was a delight to watch. The cast all sang beautifully. I have never read the book, but the stage play captured the atmosphere of a rich family living in a bubble of manners with self created rules of engagement to protect them from their own indescretions, perfectly! The actors who played the young children were also excellent. The show is a real breath of fresh air and perfect for theatregoers who are not interested in big production numbers and flashy sets, although I loved the stage design which allowed the ruins of an old country pile to come to life as Leo's (Crawford) personal ghosts also came to life. BRILLIANT! I pretty much went to see The Go-Between because of the draw of Michael Crawford being in the cast. Plus, having worked with lyricist David Woods, and admiring his past work, I was intrigued to see how he'd adapt this well-known story of, Leo, a Victorian boy whose innocence is shattered by tragic events on a Norfolk country estate during one long hot summer with the Boer war in South Africa a constant threat to young men's lives. It very much reminded me of Sondheim's 'A Little Light Music' with the songs moving the story along in a talking/singing style. In keeping with the staid Victorian era the show is very sedate and nothing "spectacular" happens except in the last few minutes of the show when the drama shifts up a gear and the tragic final scene is played out mostly in the audience's mind rather than witnessing anything on stage. I enjoyed the production and I really liked Crawford's portrayal of the grown-up Leo who acts as narrator. His singing voice is still pretty good too.